I Hope your weekend has been magical. I am trying new ways to color. It is very relaxing but I need some practice. I love these unicorn stamps. I have a few more to try out. 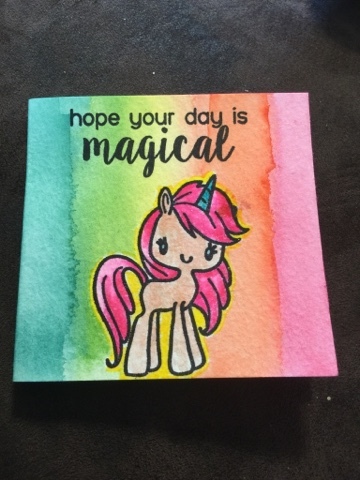 I used Kuretake Gansai Tambi watercolor for the background and Zig Clean Color Real Brush Pens to color with and a wink of Stella own for some sparkle and to blend out the color. I tried to use a removable label as a mask but I wouldn't recommend it. When it got wet it was hard to take off. I hope to post some more coloring soon. Let me know what your favorite coloring medium is.